In recent times, many parents have turned to martial arts to empower their children against the threat of bullying. Many of these parents view Brazilian Jiu Jitsu as the ideal self-defense method, as it teaches children to use leverage and guile to protect themselves from larger attackers without the need for excessive violence such as punching or kicking. Unfortunately, like any martial arts activity that involves physical contact, Brazilian Jiu Jitsu increases the risk of a child developing a cosmetic deformity called cauliflower ear. However, contrary to popular belief, cauliflower ear is completely preventable. Cauliflower ear is caused by direct impact and shear force to the outer ear. This can happen when a child is accidentally struck in the ear by an opponent’s head or elbow. A common result of this injury is damage to the perichondrium on a child’s ear. The perichondrium is a thin layer of tissue that surrounds the cartilage on the outer part of the ear. It is important because it provides the cartilage with its necessary blood supply and nutrients. Injury to the perichondrium also damages the perichondrial blood vessels, resulting in blood filling the space between the perichondrium and the cartilage. This pool of blood creates a problematic condition called an Auricular Hematoma. If this hematoma is not urgently drained, permanent damage to the cartilage will occur. The cartilage will then become thickened and scarred and start to look like the cauliflower vegetable; hence the term cauliflower ear. Fortunately, there are two effective ways to protect your child from developing cauliflower ear. The first way is through preventive techniques, and the second way is through recognizing the signs of an auricular hematoma. In terms of preventing cauliflower ear, parents should require their children to wear ear protection at all times during any type of Jiu Jitsu or wrestling activity. Most sporting goods stores sell grappling or wrestling ear guards that provide children with solid protection against any type of ear trauma. Parents and martial arts instructors should also learn how to immediately recognize signs of an auricular hematoma, which looks like a soft bulge of skin on the front surface of the ear. When pressed, this soft bulge feels like a moderately filled water balloon. The overlying skin on this bulge is often red or purple in color but can also be normally colored. If an auricular hematoma is recognized, the next step is to have it drained by a surgeon. After drainage occurs, it is important to closely monitor the ear for the re-accumulation of blood, which can happen if the perichondrium does not heal properly after the injury. It is important for the perichondrium to heal so that it can reattach to the cartilage and resume providing the cartilage with its necessary blood supply and nutrients. To ensure that the perichondrium heals completely, a compression dressing should be applied to the injured ear for one week following the drainage of the hematoma. In addition, the child should avoid engaging in Jiu Jitsu training for at least two weeks. These steps will allow the ear to completely heal. An ear infection is an acute inflammation of the middle ear caused by fluid and bacteria behind the eardrum. “Usually it starts with a cold, so the child will have a runny nose and a cough. Colds can lead to ear infections in susceptible children,” says Dr. Nguyen Pham, an ear, nose and throat specialist at CHOC Children’s. “Older kids will pull on their ears and tell you their ears hurt. For infants, symptoms can include fever, irritability, or changes in their eating and sleeping patterns. A pediatrician can look at the eardrum to diagnose an ear infection.” Generally, ear infections are treated with oral antibiotics. “The best thing families can do is to have really good hand hygiene,” says Dr. Pham. “Everyone should wash hands constantly. Encourage children to not touch their faces with their hands or rub their eyes,” he says. Colds and the flu can frequently lead to ear infections, so children should be protected against colds and get a flu vaccine, Dr. Pham advises. “An acute ear infection can lead to temporary hearing loss because of the fluid behind the eardrum. That type of hearing loss will get better over several weeks. If it doesn’t get better, that’s the time to go to the pediatrician or a specialist,” says Dr. Pham. If you suspect your child has hearing loss, ask for an audiogram, which is a formal hearing test. A pediatrician can perform this test or refer the child to a specialist such as an audiologist or otolaryngologist. IS THERE AN EFFECTIVE, PREVENTATIVE SURGICAL TREATMENT FOR CHILDREN WITH FREQUENT EAR INFECTIONS? Children who have four or more ear infections per year meet the criteria to have ear tubes inserted into the eardrum. Ear tubes create a drainage pathway for bacteria behind the eardrum to get out, so infections don’t form. This is a commonly performed surgery in the U.S. and is very effective in preventing ear infections. Dr. Pham specializes in pediatric otolaryngology – head and neck surgery. 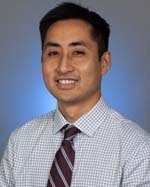 Dr. Pham completed his residency at the UC Davis Medical Center and a fellowship at Stanford University. He practiced advanced surgical techniques in airway reconstruction, otological surgery and the treatment of congenital defects at Stanford’s Lucille Packard Children’s Hospital. Dr. Pham has participated in many humanitarian endeavors, including a medical mission to perform cleft lip and palate surgeries in the Philippines and helping patients in New Orleans after Hurricane Katrina. Dr. Pham speaks fluent Vietnamese. This article was featured in the Orange County Register on February 24, 2014, and was written by Amy Bentley.